The photo of a Norwegian tanker is shown. The tanker capacity (all five of its spherical tanks completely full) is 128,000 cubic meters of liquid natural gas (LNG). A scale profile of the tanker is available. Estimate the length of the tanker. 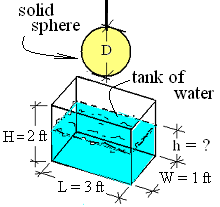 The diameter of the sphere suspended above the tank containing water is one foot. When the sphere is lowered into the tank the water contained rises to a final depth of two feet. No water spills over. Calculate the mass of water in the tank. At the simplest level a mixture is classified as homogeneous or non-homogeneous. Homogeneous means uniform through out. The text example discussed here (Sonntag et al. Example 2.1) treats its mixture as being homogeneous but the figure provided by the authors shows clearly that the mixture is not uniform throughout. Indeed, since air is included as a system component, the mixture cannot possibly be uniform throughout. This very large hurricane set some records in October, 2005. At times its winds reached 185 miles per hour. Measurements showed the barometric pressure in her eye to be 882 mbars of mercury. These pressure measurements were "static." Torricelli, a hydraulics engineer, established a number for the pressure of the atmosphere. The idea of pressure was known to many but Torricelli made that property quantitative. In 1648, the brother-in-law of Blaise Pascal carried a mercury barometer from the base to the top of the French volcanic formation, Puy de Dome. 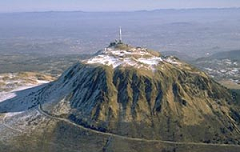 The peak of Puy de Dome is 4803 feet above its base. Approximately what difference in heights of mercury in the barometer were observed? The glass U-shaped tube contains Fluid "A" and water. Since the fluids are static, the hydrostatic equation applies. 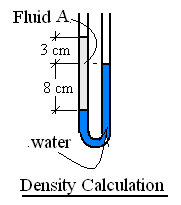 Calculate the density of fluid A. A cylindrical steel bar of length "L" and a cross-sectional area, "A" is suspended by a cable. 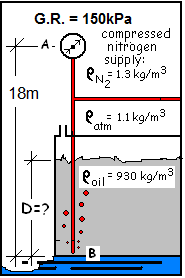 The upper third of the bar is surrounded by atmospheric air; the lower two-thirds of the bar is submerged in oil. Determine an equation for the tension of the cable? 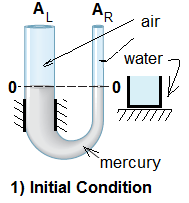 A sketch is shown being the configuration of a barometer but the fluid is water not mercury. 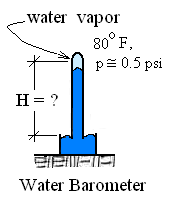 The "pressure of the void" for water is the vapor pressure of water at 80°F. This pressure is about 0.5 psi. Use the schematic. Calculate the height of the column of water, H.
The "piezometer" is a pressure measuring device of antiquity (and with a few applications now). How it works is our interest. The image depicts water flowing through a long horizontal pipe. The pipe elevation is above sea level; the water flows "to the sea." 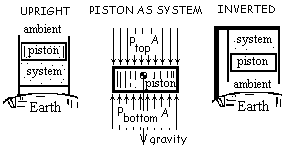 The hydrostatic principle can be used to determine the pressure of the "flowing" water in the pipe. Calculate the pressure of water flowing through the pipe. 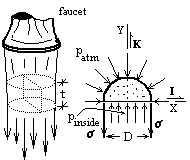 The sketch shows a gage connected to a tank. The gage has "vacuum" written on its face and its reading (GR) is 5.8 psi. 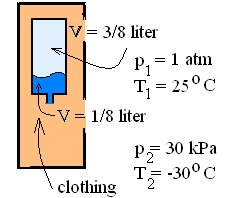 Also attached to the tank is a manometer containing oil with a specific gravity (S.G.) of 0.9. The ambient pressure is known to be 14.5 psi. 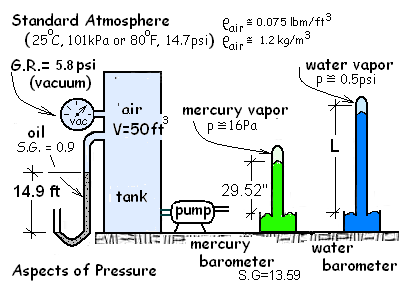 The schematic also shows a mercury barometer and a water barometer beside the tank. 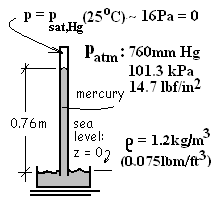 To high precision, standard atmospheric pressure equals 101.32 kPa and will support a barometric column of mercury 760 millimeters in height. These numbers are defined to be (assumed as) the surface-of-Earth average. Torricelli assumed the void at the top of the column of a mercury barometer to be "vacuum." He also assumed vacuum meant numerically zero pressure. 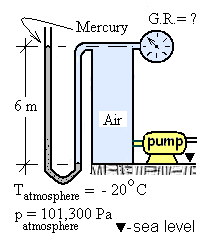 The actual, non-zero pressure, "in the void" of a mercury barometer is called the vapor pressure of mercury at the prevailing temperature. Use the information of the sketch. Calculate the "Pressure of the Void." On average, 8 persons a year drown while exploring spring-fed underwater caves in Florida. In one cave a local dive club posted warning signs and installed a mercury barometer. The schematic shows a diver's view of the barometer and its location relative to the spring surface. 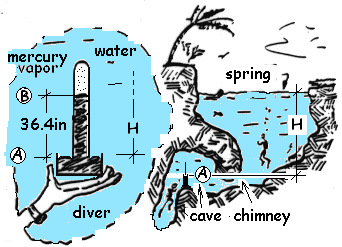 Calculate the depth of the diver beneath the surface of the spring. Many persons who have experienced the eye of a hurricane have witnessed its calmness, its winds with speeds and also its very high "tides." These are not tides. The seemingly "tide" phenomenon is more precisely called "storm surge." High water levels that occur in the eye of a hurricane are not directly related to location of the moon. The water levels are forced by atmospheric air that surrounds the storm at a distance. Estimate the height of water surge within the eye of Hurricane Wilma. 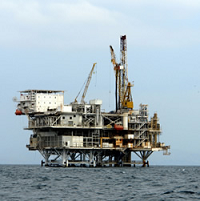 An image of an off-shore natural gas well is shown. In normal operation natural gas flows from a gas reservoir beneath the ocean floor upward through pipes to the production rig then through pipes leading to shore facilities. Occasionally valves are closed such the gas flow is stopped. The "stopped no flow" flow" condition is our interest. Use the information provided to estimate the well-head pressure of the natural gas. A glass U-tube is shown in its "Initial Condition," 1). The tube is filled with mercury to the level "0 - - 0", its legs are open at their tops to the atmosphere. The cross-sectional areas, left and right, are AL and AR. Beside the U-tube is a cup containing mw grams of water. The sketch show a bubble-tube apparatus. An open tube extends to very near the bottom of a tank of oil. In operation, compressed nitrogen is supplied to the tubing at low pressure. The nitrogen bubbles from the bottom of the tube into the oil so slowly that the pressure in the gas at depth equals the oil pressure adjacent to it (at B). Use the information given. Calculate the depth from seal level to the surface of the oil. The load carried by the six large tires of a fully-loaded strip-mine hauler is 360 tons. Carrying such a great load, we expect that the air pressure in the tires to be great. It is not possible to calculate the pressure of the air in the tires of a given truck. However knowing the hub dimensions (given below), a calculation is possible. Estimate the least possible air pressure required within each tire to support the truck and its load. Many replicas of a sculpture are to be made. The completed model is given to a technician to determine the volume of precious metal each replica will require. The material of the model is compact and its density is known. Although the model cannot be immersed in water, two precision scales are available. The image shows an edge of the Ross Ice Shelf northeast of Canada. From its top to sea level the ice slab measures about twenty meters. Presently about 5 million square miles of similar shelf-ice float on the seas of Earth. In many places that ice is melting. As floating ice melts into the sea, calculate the height of rise of sea level. The specific energy of a single phase state of a pure substance is least as solid, greater as liquid and greatest as a gas. In general, the greater the temperature or lower the pressure (or both trends combined) the more likely a gas is to be Ideal. Although we discuss the first, extensive form of the ideal gas equation, the results apply to either form. A somewhat elaborate apparatus is used to cast the steel wheels for railroad cars. The process begins when a large "ladle" of molten steel is placed in a chamber which is then covered with a heavy air-tight lid. Ceramic wheel molds are arranged on top of the chamber. A "refractory tube" or pipe extends downward from each mold to the bottom of the pool of molten steel. When the chamber is pressurized with gaseous nitrogen, molten steel flows from the ladle upward into the molds. Foghorn set up the apparatus as shown and asked you what his gage should read. Neglect the density of the ambient air and the air in the tank. While cleaning trash from an estuary, students discovered an abandoned car exposed only at low tide. They decided to remove the eyesore. Their plan was to insert inverted steel washtubs inside the car at low tide. With the bottoms of the tubs against the roof, the incoming tide would trap air in the them and float the vehicle. Once floated, the car body would be dragged to much deeper water then sunk from sight. At the World Fair (Paris ~ 1798) the crowd watched curiously as Louis Testu-Brissy assembled his hot air balloon with its platform-shaped gondola. His aides lighted the "lifting flame," the balloon inflated, became spherical and then, to the astonishment of all, the balloon and horse (with Louis astride) slowly ascended high above the fairground. German scientist, inventor and engineer. At a fair in 1654 Otto amazed the spectators. He showed them two hemispherical brass shells that fit together (to form a hollow sphere) but fell apart when not held. Next, (using the air pump he invented) Otto removed air from the inside of the sphere. Each hemisphere had built-in ring to which a rope was attached. The other ends of the ropes were attached to harnesses of two teams of horses. The horses, urged to pull, strained and snorted but, to the surprise of everyone, they were unable to pull the hemispherical shells apart. A building 1200 feet in height will have a doorway for rooftop exit. Air interior to the building will be maintained at 70°F and prevailing local pressure. The worst case of air outside in a light breeze is 40°F and 14.7 psi. 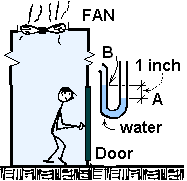 On the roof is a powerful fan which when turned on, will act to force air from the building and into the outside air. At ground level the building has a typical door which we assume to be air-tight such that air cannot leak past the seals along its sides, top and bottom. Furthermore assume the entirety of the rest of the building has no "leaks" or paths for air to enter or leave the building - the single exception is the exhaust duct of the fan on the roof. Each tank is square in cross-section and has a valve for filling with water (or venting of air) at its top. The tanks are connected at their bottoms by a pipe with a valve. Two cases are to be studied. The sketch shows the setup for both: all valves are closed, the depth of water in tank A is 5 meters and the water depth in tank B is zero. Events initiate when valves are opened. For each event, calculate the final depth of water in each tank. Earth is spherical, and above Earth, our atmosphere is a spherical shell of gases. The Earth diameter is about 6,380 kilometers and the depth of the atmosphere above its surface is about 30 kilometers. The standard atmospheric pressure, is assumed to have an average over the Earth surface of 101.3 kPa (enough precision for now). Estimate the average density of the atmosphere of Earth. An air-traveler packed a 1/2 liter, 1/4 full, rigid plastic bottle of hand lotion in a "bottom-up" position in her bag with clothing (shown in the sketch). The little spout of the bottle was in the open position but lotions hardly flow at all. The bottle was loaded into the cargo hold of the aircraft which then climbed to 35,000 feet where pressure and temperature were 30 kPa and -30°C. When the plane landed, approximately what volume of lotion will remain in the bottle? A fuel-cell is a battery-like chemical device into which flows oxygen and hydrogen. In the fuel cell these species react to produce electrical potential and current. The exhaust of the fuel cell is water. As one comes to understand basic thermodynamics, one is obliged to learn some basic chemistry.